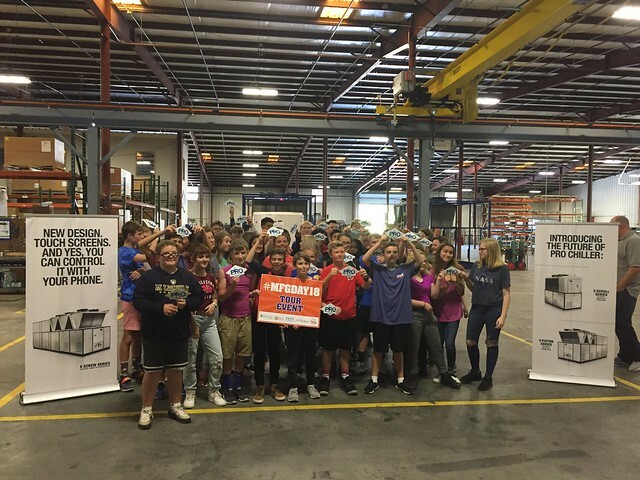 To celebrate Manufacturing Day 2018, several local businesses and Davie County manufacturers provided a unique opportunity for all eighth-grade students in Davie County. On October 5th, students from Ellis, North Davie, and South Davie Middle Schools each toured two different locations including DEX Heavy Duty Parts, Gildan, Ingersoll Rand, Pro Refrigeration, DCCC – Davie Campus, and WFBH-Davie Medical Center – Bermuda Run. Other students from all three schools spent their tour-time experiencing many different facets of Ashley Furniture Industries, Inc. This is the second year Davie County has participated in National Manufacturing Day through the collaborative efforts of the Davie County Chamber of Commerce, Davie County Schools, Davie County Economic Development, DCCC, and the Davie business community. Approximately 500 students and staff were exposed to the many outstanding career opportunities that exist here in the county. Business leaders provided informative tours including examples of how their employees use math, science, technology, and communication skills. Students were intrigued with the emphasis on safety, size of the facilities, variety of jobs including the educational requirements for the job, and the machinery used in the day-to-day operation of the businesses. DCCC showcased its many career paths to students who toured healthcare-related hands-on learning stations as well as the mobile manufacturing lab, an ambulance, a fire truck, and a tractor trailer used for the truck driving program. Hosted annually, Manufacturing Day is a national event executed at the local level and typically focuses on manufacturing careers. “We expanded the types of businesses students visited to better align the many opportunities available here in Davie. By adding our state-of-the-art medical facility in Bermuda Run and expansive career path offerings at DCCC, our event was truly a “career exploration day” for our students,” said Carolyn McManamy, director of Davie CONNECT, a new workforce development initiative of Davie County Economic Development to connect businesses to resources and kids to careers. Students were fascinated by what they experienced and appreciated the efforts of their tour guides and the employees that they had the opportunity to observe. “I thought it was interesting learning how the business works,” said Genesis Antunez, a student from South Davie. “I liked seeing how the robots worked. It was really cool,” added South Davie student, Cadyn Tanis. “Everyone worked so hard to give us the chance to see what their jobs are and to give us ideas of what we might want to do in the future,” said North Davie student, Anna Johnson. The teachers were equally impressed with the experience. Business and industry participants appreciated the chance to showcase their facilities as well as the career opportunities they have to offer to this future workforce. “Ingersoll Rand participated in Manufacturing Day because we want to inspire the next generation of manufacturers,” said Ashley Kern, human resources generalist.